Owaisi: Man with a mission? A man immortalized in history had once remarked “I will have nothing to do with pseudo-religious approach to politics“. At another time, he was reported to have said “religion should not be allowed to come into Politics….Religion is merely a matter between man and God“. This Secular Idol was none other M.A Jinnah, the founder of Pakistan. Seven decades later, it would seem, another man is moulding himself in the image of Qaid-e-Azam. This man was once reputed to have said that he had nothing against the Hindus, but is opposed merely to the Hindutva ideology. A few years ago, he was nothing better than the political phyto-planktons who thrive on the edges of our political spectrum but today,he enjoys wide media coverage. His recent political gambles seem to have paid off and he is slowly emerging as the Shah of Muslim politics in the country. The man in point here is the Naqeeb-e-Millat, Asaduddin Owaisi of the All India Majlis-e- Ittehad ul Muslimeen(AIMIM). The Owaisis are one of the oldest political families of the country, the fact that they are relatively unknown is because they have tasted success only fleetingly. Owaisi’s grandfather founded the AIMIM in Hyderabad in the 70s. The AIMIM was in fact the political revival of the Majlis e Ittehad-ul Muslimeen, founded by the Qasim Rizvi, who became famous in history as the founder of Razkaras that butchered Hindus in Nizam’s territories at the time of independence. AIMIM was able to establish itself amongst the predominantly Muslim areas of Hyderabad. 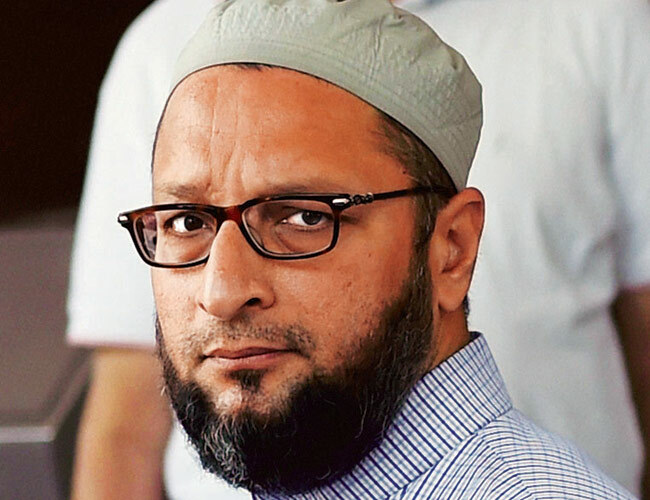 Since 1984, an Owaisi has represented the Hyderabad constituency in Lok Sabha. The AIMIM has also held several seats in the AP legislative assembly (It does so in Telangana today) as also the Mayorship of Hyderabad from time to time. These however are drab details. AIMIM shot into the spotlight in the 2014 Maharashtra Assembly elections, where it contested some 24 seats in the Muslim dominated areas of Maharashtra and opened its account in the assembly by winning in 2 seats (The so-called Marathi manoos MNS won only 1 seat). Interestingly, the party also emerged as the second largest party in Aurangabad Municipal Council. This brings us to the point of the politics of the Owaisis. The Owaisis, for all their “secular” pretense (e.g. fielding Hindu candidates in Hyderabad, castigating India’s enemies from time to time etc.) are the face of political Islam. For the uninitiated, political Islam is what drove the Pakistan agenda in the sub continent. Jinnah raised the war cry of “Islam in danger” in the 1930s, postulating that the Hindus and Muslims are a separate nation. It was this divisive agenda that culminated in partition and the resulting bloodshed. The Owaisis are the true inheritors of this philosophy. By carefully focussing their energy on the Muslim dominated seats, where they can make an impact, the Owaisis are slowly, but surely establishing themselves as the representatives of Indian Muslims, something that Jinnah and the Muslim League, in spite of several initial set backs, succeeded in doing in the 1930s and 40s. Owaisi’s decision to contest Bihar elections in Seemanchal must be seen in this light. Seemanchal is the Muslim dominated region of Bihar. Kishanganj has nearly 70% Muslim population, Katihar has 45%, Araria has around 40% and Purnea has 30%. (Interestingly, in the 2014 Bihar Sweep, NDA had lost all 4 seats in Seemanchal). The entry of AIMIM in Bihar elections will surely further complicate matters for the “Secular Alliance”, but the point to be noted is that even if AIMIM were to lose all seats, they would end up gaining a foothold, which can be expanded later. There are 2 Owaisi brothers, who are usually in the limelight. Of the two, Asaduddin, presents himself as the saner, rational voice. He is calm but forcefully puts up the case that India has not been kind to the Muslim minorities. In the past, he has vociferously demanded reservation for Muslims, he was also in the spotlight for his comments of the Yaqub Memon hanging. Asaduddin has also cleverly allied the AIMIM with larger parties that can push his cause ( TRS, Congress have been his allies in the past). Asaduddin’s policy in effect is like the policy on separate electorates that was practiced during the British times- By winning Muslim seats, he is (to repeat my point) establishing himself as the face of Muslim voters (In the British time, it was easier to do so, given the separate electorates for Muslims). The other Owaisi brother is Akbaruddin Owaisi. He is the hardline face of the party, having, at multiple times, issued statements that are bound to humiliate the Hindus and arouse passions amongst the Muslims, some of his gems include threatening to implement the fatwa against Tasleema Nasreen and Salman Rushdie, ridiculing Ram and Kaushalya, threatening to demolish the Bhagyalakshmi temple in Hyderabad, calling Hindus impotent etc. He has several cases going on against him currently. His rallies, worryingly are well attended and in spite of his hate mongering, he continues to roam free. All this brings us to this question- 7 decades after independence and the partition and the Qatl-e-aam that followed it, are we, as a nation, prepared to repeat our mistakes. I have no doubt that the AIMIM is winning elections democratically (as was Jinnah too), but the question is that are we willing to experiment once more with this brand of politics. The popular proverb goes “Once bitten, twice shy”, we are probably yet to fathom its meaning as a nation. For the sake of a peaceful future, would it be too much to ask for this brand of politics to be curtailed? That is a question that our political leaders will need to decide. Until then, lets sit back and wait for the AIMIM to spread its wings elsewhere!